FIX & SEAL MS GP SEALANT is a flexible, high strength sealant and adhesive that is suitable for wide range of applications unlike silicone sealants. FIX & SEAL MS GP SEALANT can be painted over with most acrylic and alkyd paints and is hazard free. The product can be used indoors or outdoors for sealing and/or bonding any materials. – Wall panels -Excellent adhesion to most common building materials like glass, aluminum,concrete, wood, vinyl, powder coated surfaces and many types of plastic. -Glass not recommended for PE , PP and Teflon PTFE – Advanced Hybrid Polymer technology. – Stone and concrete – Paintable. – Skirting boards – Good adhesion even for underwater application. – Window sills – Non-corrosive to metals. – Thresholds – Excellent resistance to weather and UV. 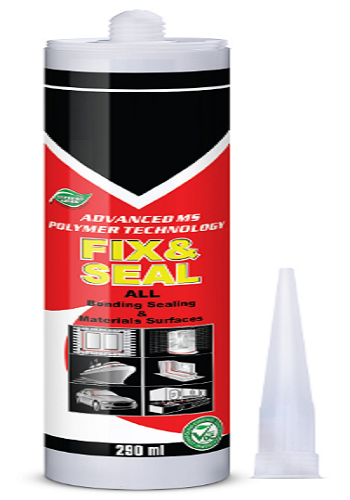 FIX & SEAL MS GP SEALANT is available in White, Black and Grey. RAL* colors are available upon request. Cut nozzle in V-shape and at a sharp angle slightly wider than the desired bead. Screw nozzle on the cartridge. For best results, apply the sealant with the use of piston-type application gun or air gun to ensure uniform thickness of bead. Regular application gun may be used as desired. Ensure that the surface to be sealed is clean, dry, sound and grease free. Metals should be cleaned with a non-oily solvent soaked clean cloth. Solvent should be wiped from the surface with a clean dry cloth. Use an alcohol such as methylated spirits on glass. When used on remedial work, all existing sealant must be removed. Porous substrates such as concrete, brickwork, mortar etc. must be mechanically cleaned of loose particles using a steel brush, sanding disc or any similar means. Immediately tool sealant after application and before skin formation. Tooling of sealant should be done in one continuous stroke. Remove masking tape immediately after tooling is completed. With oil based alkyd type paints it has been noted that the drying time for the paint is increased. Not for PE, PP, Teflon, neoprene and bituminous surfaces. Not recommended for structural glazing. Preliminary tests for substrate compatibility is recommended if doubts on suitability exists. Uncured sealant may be removed from tools, equipment and non-porous surfaces with solvents. For porous substrates, allow the sealant to cure before removal by peeling or other mechanical means. Cured sealant can only be removed mechanically. When stored in original unopened container at or below 77°F (25°C) in dry warehouse conditions, FIX & SEAL MS GP SEALANT has a shelf life of 12 months from manufacturing date. Containers should always be kept sealed when not in use. ACRYSEAL ACRYLIC SEALANT is one-component high quality, plastic-elastic sealant based on acrylic emulsion. The product is almost odor free and is not corrosive towards metals. After application, the product forms a tough rubber by evaporation of water from the sealant. 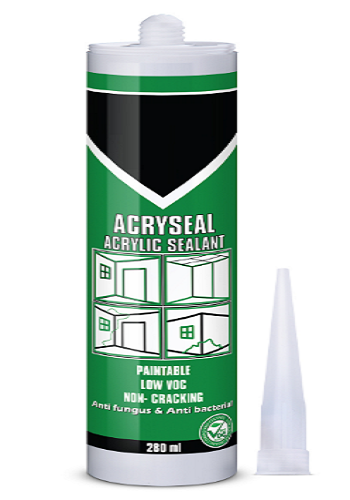 ACRYSEAL ACRYLIC SEALANT prevents air and moisture from passing through cracks and joints. Available in White and Grey color. Note: Special color orders may require lead time and minimum order quantities. The substrate areas that will be in contact with sealant must be clean, dry and free of all loose materials, dust, dirt, rust, oil and other contaminants. Non – porous substrates should be cleaned with a solvent and a clean, lint – free, cotton cloth. Wipe dry immediately with clean cloth before the solvent evaporates from the surface. ACRYSEAL ACRYLIC SEALANT should only be used where slight joint movement is anticipated. For extremely deep joints, use foam joint filler. Tool sealant after application and before tack-free skin formation. Tooling of sealant should be done in one continuous stroke. Use masking tape adjacent to joint to obtain a cleaner joint. Remove masking tape immediately after tooling. Excess caulk should be cleaned off tools and non-porous surfaces while it is in the uncured state using a wet cloth. Cured sealant can only be removed mechanically. A minimum of 2 hours dry time is required before painting with latex or oilbased paint. Allow extra dry time during periods of high humidity. When stored in original unopened container at or below 77°F (25°C) in dry warehouse conditions, ACRYSEAL ACRYLIC SEALANT has a shelf life of 24 months from manufacturing date. Containers should always be kept sealed when not in use. 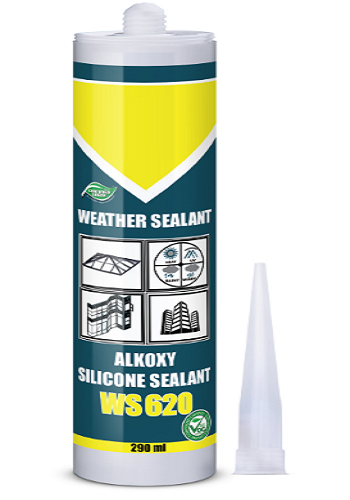 WS 620 WEATHER SEALANT is a one-part, neutral curing, high performance silicone sealant used in general construction. It is suitable for interior and exterior applications such as general glazing, weather sealing in curtain wall and building facades, and expansion joints. WS 620 WEATHER SEALANT has superior weather resistance, virtually unaffected by sunlight, rain, snow, ozone. WS 620 WEATHER SEALANT is available in Black color. The substrate areas that will be in contact with sealant must be clean, dry and free of all loose materials, dust, dirt, rust, oil and other contaminants. Non – porous substrates should be cleaned with a solvent and a clean, lint – free, cotton cloth. Wipe dry immediately with another such cloth before the solvent evaporates from the surface. Porous surfaces may need to be grind ed, free of dust and cleaned. Substrate compatibility test is always recommended. When stored in original unopened container at or below 77°F (25°C) in dry warehouse conditions, WS 620 WEATHER SEALANT has a shelf life of 12 months from manufacturing date. Containers should always be kept sealed when not in use. 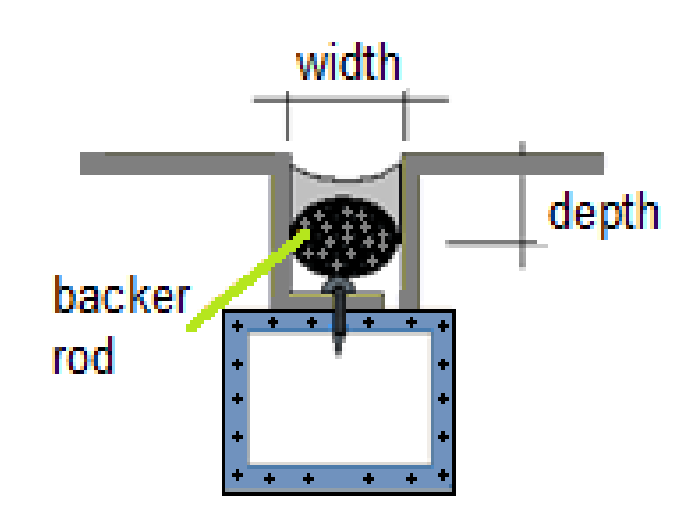 Install backing material, spacer, or joint filler to ensure correct depth to width ratio is achieved according to design. Backing materials provide back pressure and avoid three sided adhesion that limits sealants movement capability. Apply masking tapes to areas adjacent to joints to ensure neat sealant lines.